Lovely, well-maintained condo unit in the very desirable Ravines at Holly Creek!!! 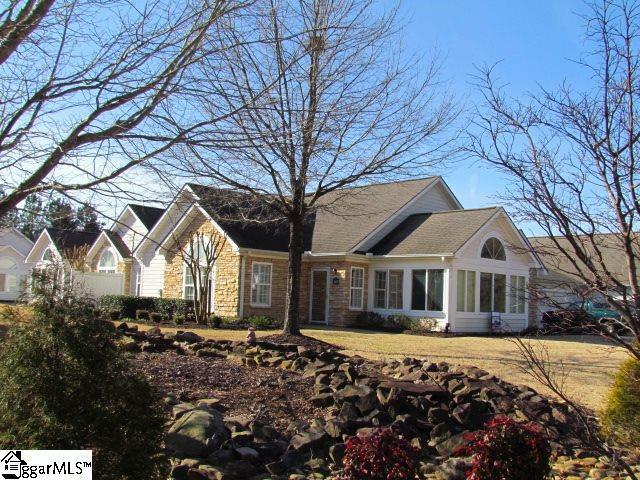 This home is available for your consideration and besides being conveniently located for shopping, the Y, medical facilities, and I85, it has nice amenities such as a clubhouse, walking paths, a pool, and a tranquil setting. This unit features 2 generous bedrooms~each with private full bath and walk-in closet, beautiful wood floors in the sunroom (loaded with windows!!) and great room, large windows, granite countertops in the kitchen, and gas hookup for fireplace. The garage has a nice storage area and fits 2 cars with space to spare! This home is located in the first unit of the complex and offers a nice view of the tree line, close proximity to extra parking, the clubhouse and pool, and looks out onto a large common lawn area! Come see your new home soon! Lot size is approximate and doesn't include common areas. Also, taxes reflect service fee only as current home owner is disabled veteran and is exempt. Tax amount shown on listing is last known tax amount from previous owner. Please remove shoes for showings as sellers just had floors/carpets cleaned. Thank you! Listing provided courtesy of Jennifer Robinson of The Agent Owned Realty.